An idea struck me when it was my son’s lunch box day on Fridays. 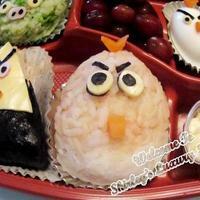 Jon loves Onigiri, so I decided to make him an Angry Birds Lunch Box! Angry Birds Bento Box for a 16-yr-old boy? Never mind, his mum is a big kid too! Guess what? It was my hubby who was more impressed & “snatched” the lunch box from Jon! Yes, Ken brought these Angry Birds to his office instead!! Angry Birds, the popular & best-selling mobile game, has taken the world by storm. The game is about these birds who’re angry because their eggs were stolen by a bunch of green pigs. Since they can’t fly, they’ve to use a giant slingshot to catapult themselves to destroy those pigs that are well protected inside their fortress. So are you ready for some action now?? Let's GAME! Mash hard-boiled egg & set aside. Blanch crabmeat in boiling water & drain. Dice it & mix with egg, mayo & pepper. Mix Ketchup into 2 tbsp of rice. Using fingers, spread some salt water onto cling wrap. Put 2 tbsp of rice onto palm & top with crabmeat mixture. Make into a ball. Add 1 tbsp of white rice to make the bottom of the Red Bird. Press well to combine the two. So what do you think of this Red Bird? Remember to be back for the Yellow Bird, White Bird & the King Pig!! Fantastic, i love it ! Thks so much for the lovely note, Malicia!